In this swing tip we’re going to look at how to help you improve your chipping and how to move you away from hitting shots that are fat or thin. So before we look at the actual technique I think it’s important to give you a good understanding of why you would actually hit fat or thin chip shots. One of the main reasons for fat and thin chip shots is that you’re trying to help the ball go into the air. So let’s take a minute to have a look at how the club’s designed and how the club is going to get the ball into the air for you. You don’t need to do that. You just have to present the club back to the ball correctly and the club will do all the work for you. So the angle of the club here, the loft on that club face, if you present this back to the ball correctly this angle is going to force the ball into the air. So if we look at this range ball here and we can see we’ve got a line across the center of the range ball there, if you bring the golf club back to the ball correctly like this, so that the club connects with the lower part of the golf ball then that angle on that club face is going to force the ball to spin upwards and it will get the ball into the air for you. What happens with most golfers is that they try to help the ball into the air and by using your wrist and flicking your wrist towards the ball the club is presented like this. So you can see you’re starting to strike in exaggeration with more of the underneath of the club, the sole of the club and that is going to connect with the upper part of the ball. So you can see that this action isn’t going to help get the ball into the air even thought it feels to you like it will. So that will translate to when you’re chipping that as you swing towards the ball you’re flicking your wrist and creating an angle with your left arm and the club. The angle is at the wrist in an attempt to try to help the ball into the air. And what’s happening is as you do that the club is at its maximum length away from your shoulders when you create this straight line. So if you’ve done this before you get to the golf ball, you’ll either ground the club and hit the shot fats or you’re skim just over the ground and you’ll catch the ball on your up swing as you try to help it go into the air, and that’s when you’re having the thin. So even though the two shots look completely different, one where you’re hitting the ground, the other one you’re hitting the top of the ball, the both for exactly the same reason you’re just flicking your wrist towards the ball and then that’s making the club head travel upwards at the ball. If you’ve caught the ground you hit it fats, if you don’t catch the ground and skim just above it you catch the ball on the upswing and hit the top of the ball and then you’ll have a thin shot. So the best way to help you to chip better is have a look at creating a straight line from your left shoulder to your left hands to the club head. Now a really good practice tip for you here is taking an alignment pole, just place this behind your left arm and so it’s going down the shaft of the club. So basically you’re extending the length of the club to behind your left arm and left shoulder and then hold the club as you usually would. Take your stance for your chipping so feel slightly narrower than usual. Left foot needs to move back if you’re a right-handed golfer just to help you rotate the left side out of the way and to create the room to swing your arms into and allow the alignment pole to just sit touching your left ribs on your left side. 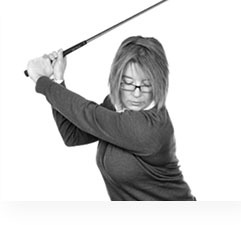 That should now help you to create a position where you really do have a really straight line between the left shoulder, the left hand and the club head and it encourages you to keep the hands ahead of the ball. That just means that your hands are on the left of the club head and the club head is on the right of your hands. So your hands are going to stay ahead. As you connect with the ball your hands will be ahead into the left of the ball. So now we’re just going to take some practice swings keeping this really straight line and the alignment pole is just going to stay touching your ribs in the same position. So we’re just going to swing back, then we’re going to take the club and swing that line through and really work on this very straight line position as you finish. That will show you if you flicked your wrist during the shot or not. So the correct finish position wants to be here. So you’ve rotated your body towards the target rather than flicking your wrist to hit the shot. So work on taking that club away and then swinging back through, and once you’ve got used to the feeling of letting your body rotate towards the target and keeping this really straight line look from the left shoulder down to the hands and then down to the club head, then start to putt the ball in and just work on slightly touching the mat hearing a little brush noise as you swing through to ensure that the club head is going to strike the ball low down. So have a go at hitting a shot like that. The good thing about this drill is you can actually play the shot with the pole in. So there’s not way you can get this incorrect. If you try to flick your wrist here you’ll feel the pole trying to hit your side. Okay, so it really indicates to you that you’re using your wrist incorrectly rather than keeping the straight line and swinging that straight line through the ball. So set up, work on that straight line position and allow the body to rotate as you move through the swing. Hold the finish and you can see that from the left shoulder down to the hand and into the club head you’ve really kept that straight line position. Once you’ve got used to that take the pole away and then work on having the same finish position. So again swing that straight line position from the start, swing that straight line away and through and then look at holding that finish position and you should see that the left shoulder, the left hand, and the club head all have that same straight line look rather than this kind of finish position. That should really help you improve your chipping and give you a much better connection.